– Orient selected joint or the whole joint hierarchy. – Can select the Aim, Up and World Up axis. (Can check to auto guess the World Up vector). 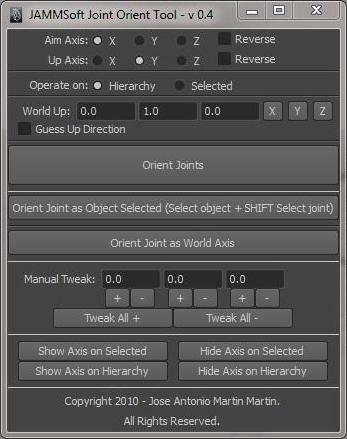 – Orient the selected joint or joints with World Orientation. – Orient the joint as another selected object. – Manual tweak on the three axis. – Show or hide the Local Rotation Axis on the selected joint or the whole joint hierarchy. Works fine on the latest version of Maya. Tested on 2009, 2010 and 2011. The interface had to be tweaked in order for a correct display on Maya 2011, so in the older versions it will look a little bit weird.